That was the response of a boy to a judge who was questioned when he was brought to the court by the British Police in 1921. 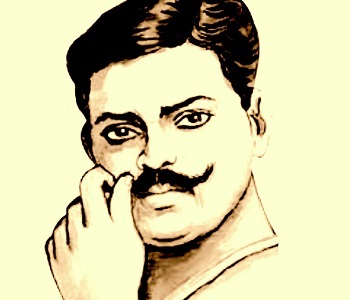 He was none other the great revolutionary figure of the Indian history- Chandra Shekhar Azad. He was just 15 years old when participated in non-cooperation movement launched by Mahatma Gandhi. The teenage boy’s courage astounded the judge and looking at the tender age, he gave him 15 whiplashes as punishment. Ever since the boy came to be known as Azad (Free) in the history of freedom struggle of India. He remained uncaptured by the police till the last. Let’s go down the memory line to find out his velour. The Chandrashekhar Azad was born as Chandra Shekhar Tiwari on 23 July 1906 at village Bhavra in Jhabua District of Madhya Pradesh. Sitaram Tiwari was his father and Jagrani Devi Tiwari was his mother’s name. He was educated in Sanskrit school in Varanasi. Non- cooperation movement was in its full swing, Gandhiji had to suspend it because of the violent incident that took place in Chauri Chaura in Uttar Pradesh. That brought disappointment to the nascent revolutionary. 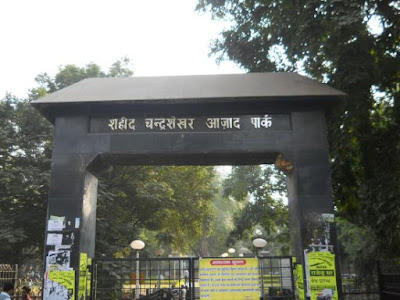 Then he met Ram Prasad Bismil through Pranavesh Chatterjee and joined the group called Hindustan Republican Association and Ram Prasad Bismil, Yogesh Chandra Chatterji, Sachindra Nath Sanyal and Shachindra Natha Bakshi formed the group. Soon Azad became a very active member of HRA. He planned to rob government treasury to meet expenses of revolutionary activities. Azad target the train travelling from Shahajahanpur to Lucknow carrying government fund. In 1925, Azad with a few of his companion got on the train N 8 Down. Then, at a certain point, they pulled the chain as per the plan they hatched and robbed Rs. 8000 from the guard cabin. One passage died in the ensuing firing between the revolutionary group and government armed personal. The British police were in search of the involved revolutionary group as the incident was declared murder and robbery. Ram Prasad Bismil, Ashfaqulla Khan, Thakur Roshan Singh and Rajendra Lahiri were sentenced to death while Azad, Keshab Chakravarthy Murari Sharma were managed to escape This incident is known as Karori Train Robbery in the Indian History. Azad believed that fund collected should be used for the sake of the country. His idea was to liberate his motherland from the clutches of the British Empire. After the Kakory train robbery he reached Kanpur where he met Bhagat Singh, Sukhdev and Rajguru and he reorganized HRA and renamed it as Hindustan Socialist Republican Association (HSRA). Lala Lapatrai died soon after the protest of the Simon Commission that arrived in India in 1927. He received serious injuries as he was hit by lathis strikes carried out by the British Police during the protest of the Simon Commission. HSRA held James Scott, the superintendent of Police, responsible for the death of Lalaji and the group decided to take revenge for his death. As a result, together with Baghat Singh, Sukhdev Thapar and Shivram Rajguru he plotted the assassination of the James Scott. But, John P. Sauders, the assistant superintendent was killed due to identity is mistaken on 17 December 1928. Azad remained at large as a terror to the British police. He was first on their hit list and the British police badly wanted to capture him dead or alive. The government has announced Rs. 30000 thousand on his head. On February 1931 in the early morning, he went to meet with Jawaharlal Nehru at Anand Bhavan in Allahabad with a view to convincing him to persuade Gandhiji to talk to the Viceroy Lord Irwin and reach an agreement with the British Government in the forthcoming Gandhi-Irwin Pact. His meeting with Nehru was not successful and Azad went to Alfred Park on his bicycle. He sat under a tree of Jamun after propping his bicycle on the tree. He was taking over an important issue with Sukhdev Raj. Deputy Superintendent of Poice Bisheshwar Singh along with SSP (CID) John Nott-Bower arrived there. There fierce gun fighting between Azad and the troop. Azad made Sukhdev Raj escape by providing cover fire and later he killed three policemen leaving the SP wounded badly. Azad managed to keep the police at bay for a long time with his Colt pistol. He received severe bullet wound in his right thigh making it difficult for him to escape. After some time seeing the ammunition ran out from his pocket and no means to escape he shot himself with the last bullet and upheld his vows never to be captured by the British. He was a great threat to the British Empire as long as he was alive. He was the symbol of valour, courage and optimism. He set the patriotic sentiments on fire among the youth and became the source of inspiration. He dreamt of free India based on the socialist idea and committed himself towards realizing his dream. The indebted nation pays homage on his birth anniversary on 23 July. To know about another freedom fighters from our region please read my blog Gundadhur and Birsamunda; Their Contribution. Thank you very much Arjun Sir! Please, Keep reading my other blogs too. Thank you very much Rahul Sir! I hope you have read my other blogs.